I'm having a very good weekend! Now I wouldn't say I'm a glory hound, but there is something really great about seeing your work on other peoples blogs! Firstly, the lovely Lynne at Lily's Quilts has today put up my Reversible Poncho Tutorial on her fantastic blog, which I made for the Abakhan Budget Buster Challenge. The lighting wasn't great on Tuesday when I completed this, so the photos weren't as bright as I'd like, but hopefully the instructions and photos will be good enough to enable people to make one should they so wish! It was my first tutorial, and they're quite difficult to do justice to (I'm not sure if I have done it well yet, I guess we'll see in the coming weeks if anyone decides to make it! ), but I think I will do some more tutorials in 2013, as it's quite a good process to get you thinking about the whole creative process, and I really want to give something back to the online community whose tutorials I have found so helpful. 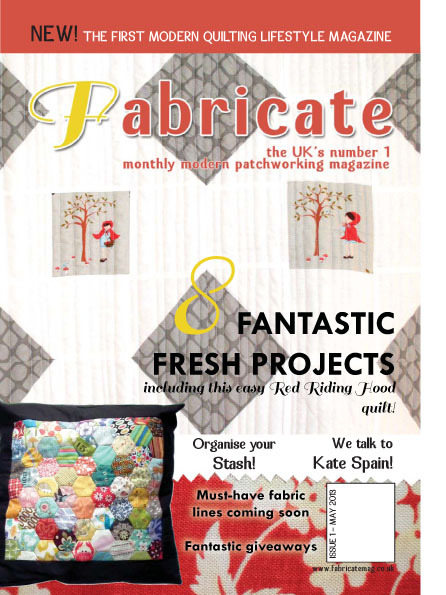 The lovely Kerry at PennyDog Patchwork, has launched her Indiegogo Fundraiser for a new UK monthly quilting magazine. If you are the kind of quilter who has found that the UK market just doesn't have a good, reliable monthly modern quilting magazine (I know Modern Quilting has left a lot of UK quilters angry and disappointed), then this will be the publication for you! But, it can only happen with your help and support. Kerry needs to raise £5000 to start the magazine and pay for shelf space at the retailers, and is willing to exchange it for subscriptions or ad space for businesses. I got to meet the Kerry last weekend, she's pretty local to me, only about 20 minutes away, and she is absolutely lovely. We have been chatting over email/blog a bit in the last few months, and when she said she wanted to start a new magazine, I was really enthusiastic about the idea. So when Kerry asked me if I would let her use one of MY QUILTS for the mock up of the magazine cover, I was happy to oblige! So, as you can see if you look a little closer at the front cover, that grey quilt, is MINE, yay! So, now for the key bit of this post, please head over to Kerrys Indiegogo Fundraiser, and support her if you can. I for one will be signing up for a subscription, and I clearly wont be the only one. I came across the lovely Susan at Canadian Abroads blog post this morning about the very same thing, and got a little buzz seeing my quilt on her terrific blog too. If you haven't seen Susans blog, head over and have a look, she's quite prolific in her quilting/sewing, and she blogs most days, all good stuff. p.s. I'm not being paid to promote Fabricate, I have no financial links to it, although I did suggest the name! So pleased to know that is your quilt. It is gorgeous and deserving of the cover. Ange, how fantastic! Your work looks so lovely on a magazine cover! They are 2 very good reasons to be feeling rather happy - congratulations on both accomplishments! OMG Ange! How awesome for you! Your quilt looks fab on the magazine cover and to have your gorgeous poncho tutorial on Lynne's blog is so exciting! Well done lovey. Wow - congrats on both! That poncho is adorable - as is the quilt! WOW!!! Fantastic news, well done you. I'm off to check out your tutorial (can't promise I'll make one though, do 6yr old boys let you dress them in a poncho?!) and Kerry's blog too. How negative is too negative?? ?